Gout. It is always gout! Scenario: A 54 year old male is presenting to the ED with severe right foot and ankle pain and swelling. The case is seen by one of the EM-Residents and discussed with Dr. Bongartz, Chair of the Inflammatory Arthritis Clinic in the Division of Rheumatology, Mayo Clinic Rochester. The patient is reporting rapid onset right foot pain. He went to bed feeling well but woke up around 2.00 Am with excruciating pain in his right mid-foot area. He did notice redness and significant swelling, which did rapidly spread to his ankle. He is now rating his pain as 10/10, not able to tolerate anything touching the involved area. He denies any other acute complaints no other join areas involved. Resident’s question: there are so many different diseases presenting with non-traumatic joint pain – what is my role as an EM physician? Dr. Bongartz’ s Answer: Like in many other situations, the primary goal of the assessment in the ED is to identify conditions that would lead to significant morbidity and/or mortality if not addressed immediately. In patients with acute inflammatory mono-and oligoarthritis, identifying and treating the individual with septic arthritis is the most important task for the EM physician. An acutely infected joint is associated with high morbidity and mortality – and quick intervention with antibiotic therapy and joint lavage can save joint function and lives. The secondary objective is to provide the patient with pain relief – acknowledging that the most appropriate strategy may vary depending on the cause of the patient’s joint inflammation. For our patient, we will have to utilize clinical information, physical exam findings and various laboratory based tests to clarify whether our patient needs to be treated for septic arthritis or can be managed as an outpatient for an alternative cause of acute arthritis. Resident’s Question: it looks to me like this is the typical “gout-patient” with metabolic syndrome and many risk factors for gout. Is any additional work-up required? However predictors such as diabetes are also associated with a risk of septic arthritis. Given the substantial morbidity and mortality associated with septic arthritis if left untreated, we need a very high negative diagnostic probability before exclusively focusing on a non-septic etiology. In most cases, patient history alone is not sufficient to achieve the required level of diagnostic certainty. Resident’s Question: Are there additional questions I could ask the patient to achieve a higher level of diagnostic certainty? Dr. Bongartz’ s Answer: It is very important to ask the patient explicitly for any pre-existing diagnosis of joint disease and/or prior flares of inflammatory arthritis. Sometimes additional work-up may not be required if the patient is affected by a well established disease and experiencing a flare that is very similar to prior flares. However, caution is warranted: patient’s with pre-existing joint disease are at a higher risk of septic arthritis, and any deviation from the usual “flare-pattern” should raise suspicion for possible septic arthritis. Musculoskeletal: very tender right dorsal mid-foot and ankle with swelling, redness and warmth. Limited plantar and dorsiflexion. Resident’s Question: Can I use any of the physical exam findings to rule in/rule out septic arthritis? Dr. Bongartz’ s Answer: The local physical exam findings are of limited utility to differentiate septic from non-septic arthritis: Severe pain, redness, warmth and swelling are often universal findings. If symptoms are limited to the base of the big toe (Podagra), the underlying cause is unlikely infectious. While the presence of tophi has been found to be a very specific finding in patients with gouty arthritis, we need to be cautious: this data is derived from outpatient cohorts and may not be equally valid in patients presenting to the ED: While patients with tophi undoubtedly are affected by chronic gout, it does not exclude a septic etiology for the acute arthritis they are presenting with to the ED. In our patient, the physical exam finding just confirm the presence of inflammatory midfoot and tibiotalar arthritis, but are insufficient for differentiating between a septic versus non-septic etiology. Resident’s Question: But our patient doesn’t have any fever. Doesn’t this argue against a diagnosis of septic arthritis? Dr. Bongartz’ s Answer: No. There is a widespread misperception that the absence of fever would make a diagnosis of septic arthritis unlikely. However, the opposite is true: Most patients with culture confirmed septic arthritis are afebrile, and the likelihood for septic arthritis is, in fact, lower when fever is present (LR for septic arthritis if patient is febrile: 0.67) (Margaretten ME et al. : ” Does this adult patient have septic arthritis?” JAMA. 2007). What about a blood draw? Wouldn’t we expect the white cell count to be elevated in septic arthritis? Or the serum uric acid level elevated in gouty arthritis? Dr. Bongartz’ s Answer: In the acute setting, laboratory testing is of limited value. The white cell count is not a useful test to distinguish between septic and non-septic arthritis. In half of the cases of septic arthritis, the white cell count was within normal limits (Li et al., Acad Emerg Med. 2004). If laboratory testing doesn’t help – what else can I do to achieve a higher level of diagnostic certainty and finally make a treatment decision? Dr. Bongartz’ s Answer: The key diagnostic test to evaluate patients with acute non-traumatic mon and oligoarthritis is joint aspiration with synovial fluid analysis for crystals, cell count and microbial studies (gram stain and cultures). Synovial fluid analysis in our patient did confirm the presence of an inflammatory aspirate with intracellular monosodium urate crystals, consistent with a diagnosis of gout. But isn’t there a possibility that the patient does have intraarticular crystals and a concomitant septic arthritis? Dr. Bongartz’ s Answer: Indeed, the presence of crystals does not fully exclude a concomitant infectious process – it just makes it much less likely. Rare cases of overlapping crystalline and septic arthritis have been reported in the medical literature. Unfortunately, the gram stain does have a very low sensitivity and culture results are not immediately available. Therefore, it does require a high level of clinical suspicion in cases where the overall risk profile and clinical presentation does indicate a high risk for septic arthritis in spite of crystal detection in the synovial fluid. For example, a patient who never experienced a prior flare of gouty arthritis and is now presenting with an inflammatory knee arthritis (55 ooo cells/mcl synovial fluid) 5 days after drainage of a dental abscess, should be treated as a case of septic arthritis even if crystals are present. The patient was given prednisone 30mg orally until symptoms have resolved, followed by 20mg daily for 2 days, followed by 10mg daily for 2 days. He was discharged home and encouraged to schedule a follow-up visit with his family physician to discuss discontinuation of hydrochlorothiazide, adjustment of blood pressure medication and a long-term plan for gout management/prevention of recurrence. Resident’s question: why did you choose prednisone over other options such as colchicine or NSAIDs? And what about Allopurinol? Dr. Bongartz’ s Answer: The key therapeutic intervention for acute gout is inflammation control. Uric acid lowering therapy has no role in the acute setting and would likely result in worsening of the inflammatory reaction due to crystal shedding. However, if the patient already is on uric acid lowering therapy, this should be continued unchanged. Since the onset of action and relative improvement in pain scores is very similar when comparing these agents, the selection is mostly dependent on the presence of comorbidities and possible interactions. In addition, if the patient did experience prior flares of acute gout, it may be reasonable to utilize the same medication that has been effective and tolerated in the past – unless new co-morbidities such as renal dysfunction or possible medication interactions prohibit its use. NSAIDs: I use regimens such as indomethacin 50mg three times a day or naproxen 500mg 2 times daily until the patient has been asymptomatic for 1-2 days. Many other NSAIDs have been used in clinical trials and shown effectiveness. In elderly individuals, I usually avoid the use of NSAIDS due to frequent comorbidities such as heart failure and enal dysfunction. Colchicine: the old high-dose regimen has been replaced with a more tolerable low-dose regimen which is as effective: the patient should take 1.2 mg (2 capsules) of oral colchicine, followed by 0.6mg an hour later and continued on treatment with 0.6mg twice daily until 2 days after resolution of the attack. Oral glucocorticoids: Steroids are often a preferred choice in patients with various comorbidities as they can be safely given to individuals with advanced renal disease and have little interactions with other medications. They tend to be my first choice in elderly patients. I usually use doses of 20-40 mg daily, maintaining the intial dose until symptoms have resolved. I then give a taper of 4 additional days as there seems to be a somewhat higher risk of rebound attacks when using corticosteroids. In our patient, prednisone appears to be the most appropriate choice as the significantly reduced GFR prohibits the use of NSAIDs and colchicine. 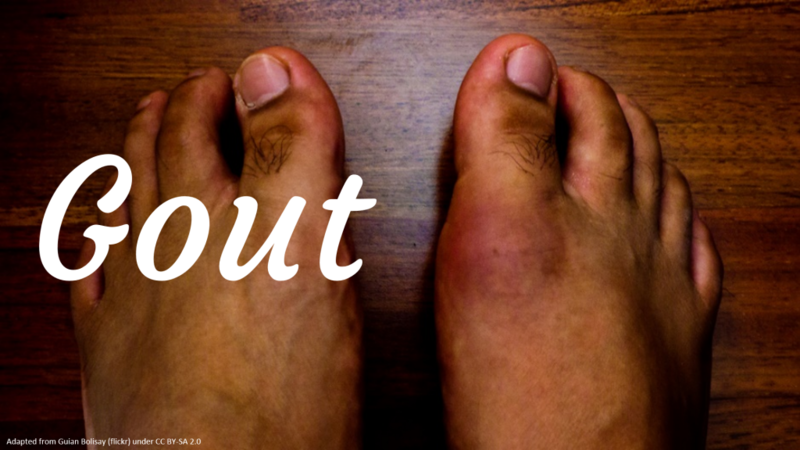 Are there situations where you would hospitalize a patient with acute gout? Dr. Bongartz’ s Answer: Patients with acute gouty mon-or oligoarthritis can often be discharged home after anti-inflammatory treatment has been initiated and the importance of an outpatient follow-up visit has been explained. However, elderly patients may be significantly disabled and requiring admission. In addition, some cases of oligoarticular/polyarticular gout can be associated with a severe systemic inflammatory response syndrome (SIRS) and constitutional symptoms, requiring admission for supportive care, pain management and high dose corticosteroid treatment.